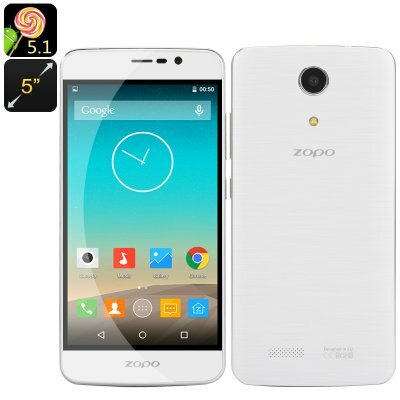 Successfully Added Zopo HERO 1 Smartphone - 5 Inch HD Screen, Android 5.1, MT6735 Quad-Core CPU, Smart Wake+Gesture Sensing, Hot Knot, OTG (White) to your Shopping Cart. Get your hands on a beautiful 5 inch smartphone with an HD screen, powerful quad core processor, great connectivity and stunning design. Hero 1 is a new flagship phone from the popular manufacturer – Zopo – guaranteeing great quality and best value for money. Feast your eyes on Zopo’s latest creation - a beautiful smartphone with a brush metal-like finish in a classic white color. The smartphone comes with a 5 inch HD screen, giving you access to clear and bright imagery – whether you are watching a video, flipping through photos, playing mobile games or simply browsing the web. The device comes with two great features – Smart Wake and Gesture Sensing. They will help you efficiently navigate the phone by getting to favorite apps right from the locked screen or controlling simple actions with just a wave of the hand. Zopo’s Hero 1 comes with Android 5.1 – so you will have access to all the latest games and apps from the Play Store. With 16GB of internal memory and the option to add 64GB more onto that via an SD card, you’ll have plenty of space to store everything you need. The smartphone is backed up by a powerful quad core CPU, letting you multitask, play games, enjoy various media and more with zero lagging. Hero 1 offers you great connectivity options, as it covers a wide range of networks including 4G: FDD 800/1800/2600MHz. With two SIM card slots, you will be able to make full use of the smartphone’s extended connectivity and separate your business and private mobile accounts, if needed. The smartphone comes with Hotknot – a feature similar to NFC – that lets you exchange information with other Hotknot supporting devices by simply touching the screens of the phones together. OTG, or USB On-The-GO, is one more time saver for Hero 1 users. It enables efficient two-way data transfers with other USB devices.